The Perfect Sign at Fishtown! | Art Sphere, Inc. The Perfect Sign at Fishtown! The students at Fishtown created a hand painted sign to hang above their artwork in their classroom. 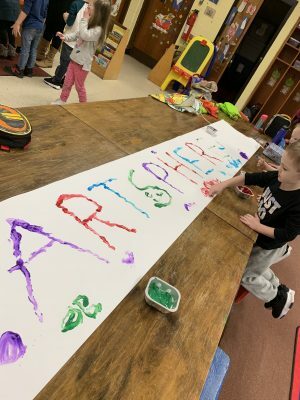 They were able to finger paint all over the sign reading “Art Sphere”. This is now hanging above the projects they made the first week of the Winter session, the Baby Shark bubble wrap piece, and rainbow fish. 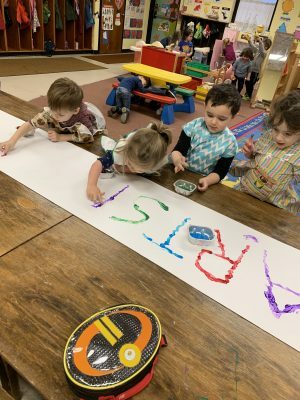 With each passing week, the classroom is getting more and more colorful! I am so happy they were able to create some art outside of art class. The sign looks terrific, and it looks like they had a great time making it as well. Share the post "The Perfect Sign at Fishtown!"